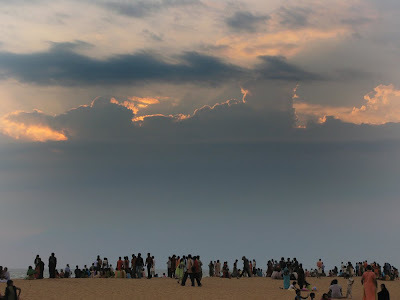 A visit to Kerala's capital city is never complete without its most magnetizing showcase: the Shankhumugham Beach. 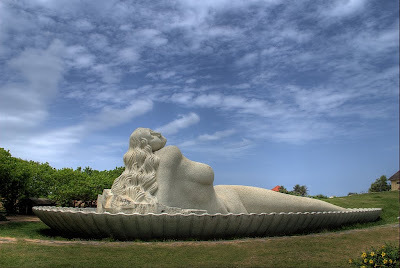 Shankhumugham, meaning the face of the conch is one among the many famed beaches of Kerala. I have senile yet stainless reminiscences of my early visits to Shankhumugham as a kid, rearing to tear away from the firm grip of my mother, out into the ravishing blue waves frothing up on kissing the golden brown sands. Evenings in Shankhumugham were the most enjoyable days of my childhood because it almost always had the Bombay sweet and the Cone Icecreams as toppings! And a wind-up dinner out in one of those hotels opposite Secretariat once we were back to the city. My love affair with the place continued into my adolescence with many memorable afternoons with peer groups, bunking the classes. The fondness for the place only increased when I left Trivandrum for greener pastures to build my career. The off-trips to my hometown always featured a re-grouping with the old pals who were still at Trivandrum. The only difference being that now we reach Shankhumugham after dusk-fall, when usually that's the time we used to leave the place as a kids. Aha, the smile still comes to me when I recollect the anxious eyes of my mother shouting after me when I told her I'm going to Shankhumugham to see the 'Tsunami' after the fateful day in 2004. I remember the then CM Oomen Chandy's warning on TV that there was chance of another Tsunami and we couldn't resist the adrenaline rush to see it! Good ol' foolish days, or the pseudo-bravery, or was it the over-confidence that it would surely be a false alarm, me and my amigos reached Shankhumugham in a flash. It would be interesting for you to comprehend that as a Trivandrumite I visited Kovalam only 3-4 times, the first time as a college student!! I suspect the bikini-clad Caucasian figures on the famed beach must've made my family chiefs think twice about taking their kids to Kovalam. Whatever, I don't yearn for the Eve's Beach except for the royale seafood and those magnifique femmes...Shankhumugham has always been my first choice...and will remain so. Honestly, over 2 decades of clock-tickings haven't robbed the shores off any charm. The water may be a tad brownish and the place may have become more crowded, parking fees may have tripled and quadrupled but the charisma that made Shankhumugham, Shankhumugham still remain... A 200m walkway has been built and a few hi-mast lights installed, rest all remain unchanged. The star-fish restaurant, the Mermaid, the hillock giving the perfect view of the take-off of the metal birds, those stone marvels... all still the same! Surely, would the word 'nostalgia' have the same meaning if we were in a perpetual world? But it is promised that things are deemed to change now. The authorities have drawn up some whacky ideas for a complete overhaul of the place.. And they tell me the structure rising up next to the playground is a Police Station! Yes, a Police Station bang inside a Beach Park.. wtf, who approved this??? What next? A morgue with a view perhaps? So there! 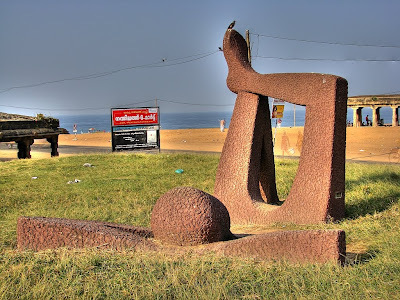 Trivandrum may have some very famous beaches but none so enticing as the Shankumugham, if you ask me. May be the airport and the closeness to the city have helped the brand-image but no, there is something more to the place. I'll come here again, inshah allah, some good things should never come to an end. The breeze, the horizon, the sands, birds, the people, the ever-enduring sea and the feeling of being home... Shankhumugham never ceases to exhilarate. Here is my fav beach in a nutshell, courtesy Tom Thomas from Vanity Moments.